As we are progressing with our work with registering the material from the recent excavations at Alvastra pile dwelling we also have to study earlier research concerning the materials found during the excavations in 1909-1930. 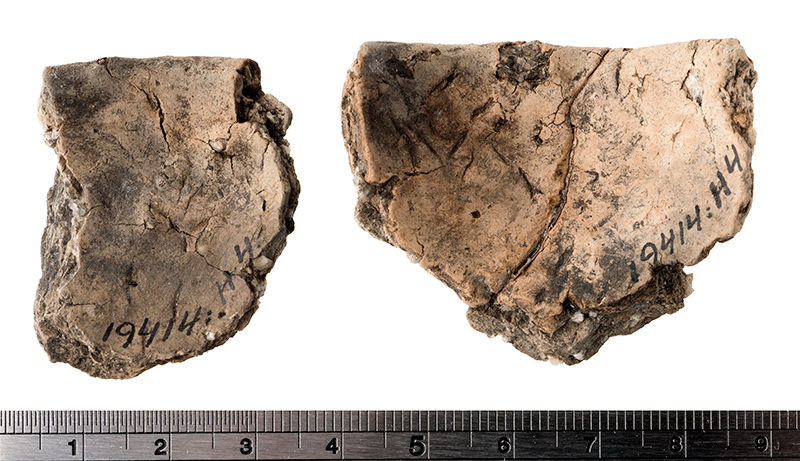 When we recently discussed the literature we became interested in a few sherds that were mentioned in Browall 2011. “One vessel could be easily reconstructed. 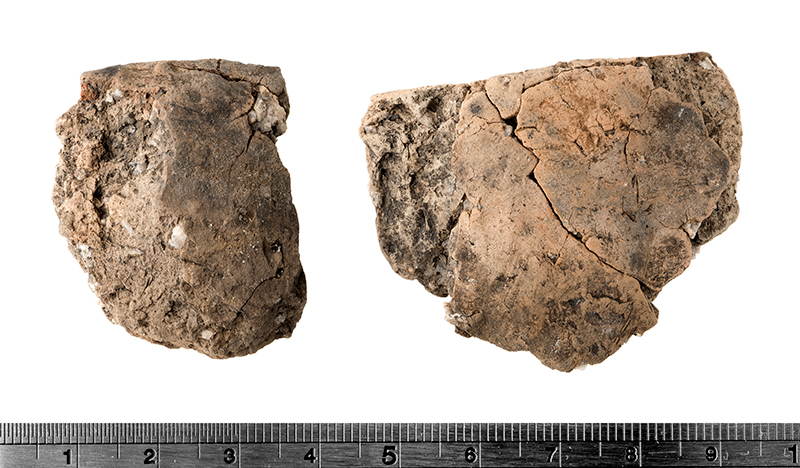 The object consists of six undecorated sherds (19414: H 5, 16 and H 4). The sherds are all parts of a small, low clay bowl and today they represent about half of the original object. Unfortunately the vessel base is missing. The outer diameter of the bowl seems to have been around 7.5cm. The ware is light in colour and it is partly mixed with larger grains of temper. The object was found on floor 10 within the eastern parts of the pile dwelling as well as in hearth 46…” (Browall 2011: 283, translation made by the author). Our curiosity led us down to the museum storerooms to try to find this ceramic object. The object we found (FID1195888 and FID1195892) is shown in the pictures below and it is in fact a miniature vessel, a vessel type normally found in Pitted Ware contexts. The general definition of a miniature vessel is that the diameter of the vessel should be less than 10cm (see Papmehl-Dufay 2006:57 and literature cited there). 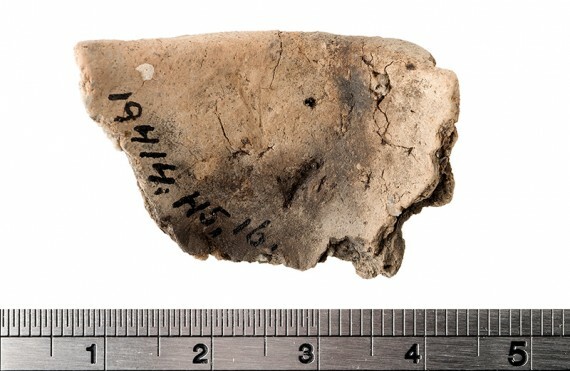 The specific vessel had an original rim diameter of approximately 6,5cm which places the vessel within the miniature vessel group with good margin. We all agree that the particular object is in fact a miniature vessel. The exterior of two rim sherds FID1195888, which combined with FID1195892 comprise a section of the miniature vessel. Photo: Ola Myrin, SHMM. The interior of two rim sherds FID1195888, which combined with FID1195892 comprise a section of the miniature vessel. Photo: Ola Myrin, SHMM. The exterior of a rim sherd FID1195892, which combined with FID1195888 comprise a section of the miniature vessel. Photo: Ola Myrin, SHMM. The interior of a rim sherd FID1195892, which combined with FID1195888 comprise a section of the miniature vessel. Photo: Ola Myrin, SHMM. 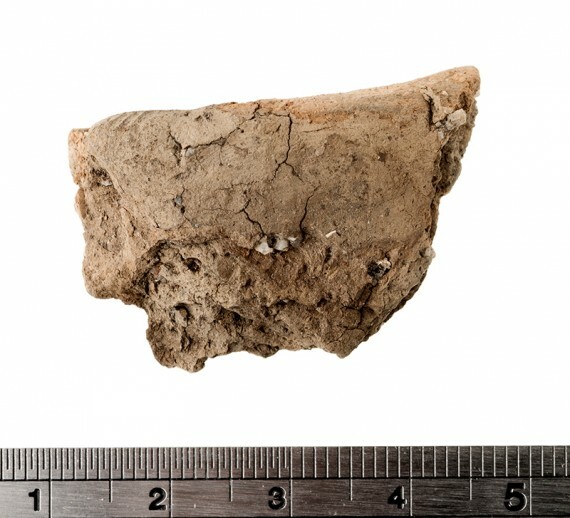 We later realized that this is the same cup that Hulthén (1998) mentions in her text concerning the Pile Dwelling pottery as being the only example of a modelled vessel at the site (Hulthén 1998:17). Something that is clearly visible when looking at the object. All in all we found an interesting object in the storerooms that we were able to classify as a more or less typical Pitted Ware object made with techniques that resulted in a ware that we as of this moment define as Pile Dwelling pottery. Hulthén, B., 1998. The Alvastra Pile Dwelling Pottery. An attempt to trace the society behind the sherds. The Museum of National Antiquites. Monographs 5. Stockholm. Papmehl – Dufay, L., 2006. Shaping an Identity – Pitted Ware Pottery and Potters in Southeast Sweden. Theses and Papers in Scientific Archaeology 7. Stockholm University. Stockholm.